Many people may not know this but Olea Kiosks at its core is a family business. There are several members of the Olea family that both own and work here at the factory. Because of that familial core Olea strives for good customer service. 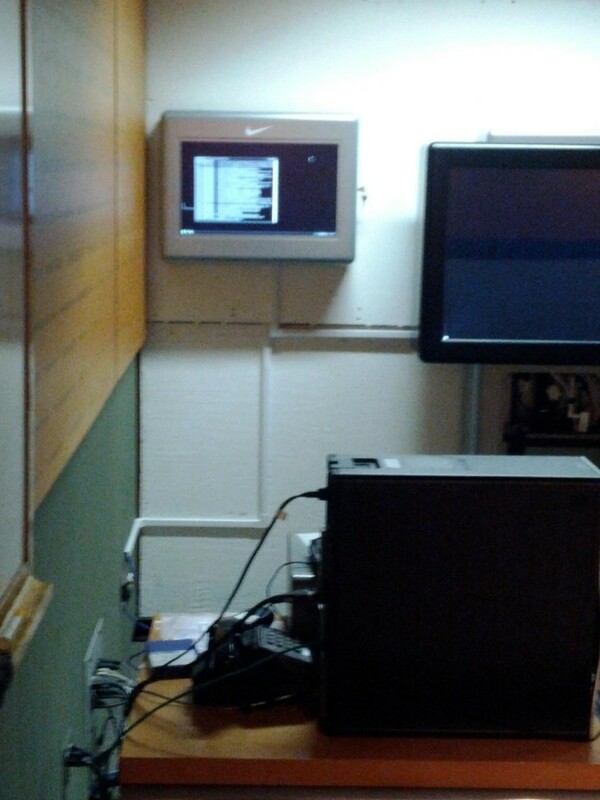 A few months back the Nike VIP installation crew from Olea was out installing some Nike SSP Training Stations for one of Nike’s biggest University Football teams when they encountered a problem. The Kiosk Machines were to be installed in a room that had this really nice wood paneling on the walls that had the University Logo running through it every few inches. In order to hang the Nike machines the wood paneling had to be removed so as not to ruin the wood for the eventuality that the machines would be moved to another location and the wood reinstalled. When the Olea VIP team arrived the wall had been “prepped” using a few different thicknesses of plywood by University staff and barely painted with a single layer of white paint that had soaked in. 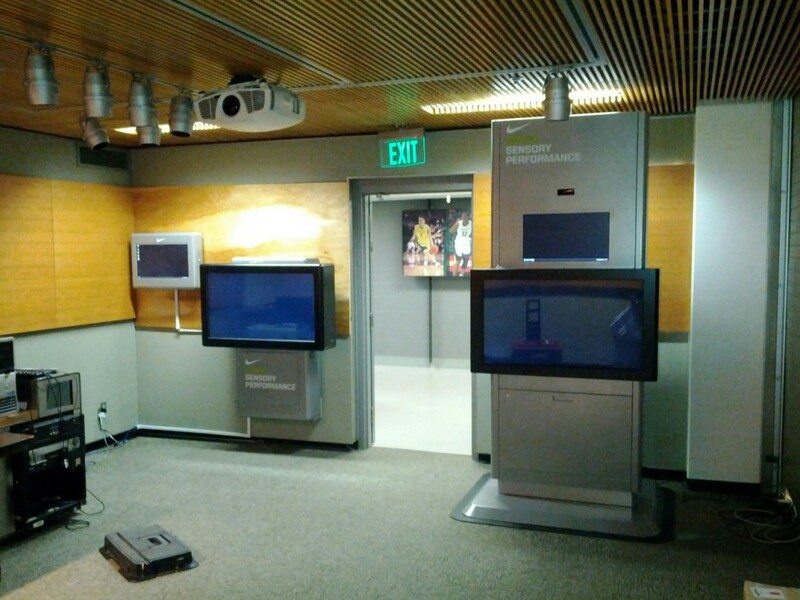 Not wanting to upset anyone, the Olea VIP team proceeded to install the kiosks as planned doing the best they could. Later in the evening about 6:00 I received a call from one of my team members and he seemed a little distressed. He proceeded to tell me the story of how the wall was previously prepared and that they did everything they could to make the unit look nice. He also sent me the before picture below. It was actually pretty horrible looking and they didn’t know what to do. 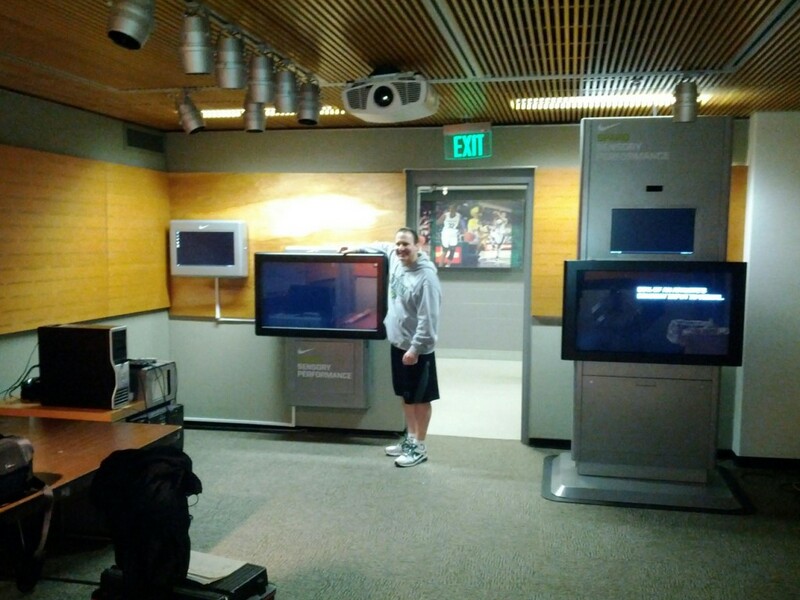 Now, this University is no ordinary school and suffice to say that there was a 100% chance that Phil Knight himself would eventually see his Kiosk Machines in this room and my team knew that. I had to make some quick decisions because the crew was scheduled to fly back home the next afternoon after some sightseeing. A call was quickly made to one of the Nike staff at home and they agreed that something had to be done no matter the costs involved. So in the morning the team went to the local Home Depot and picked up several sheets of plywood, stain, screws, and other equipment that they would need to make things right. 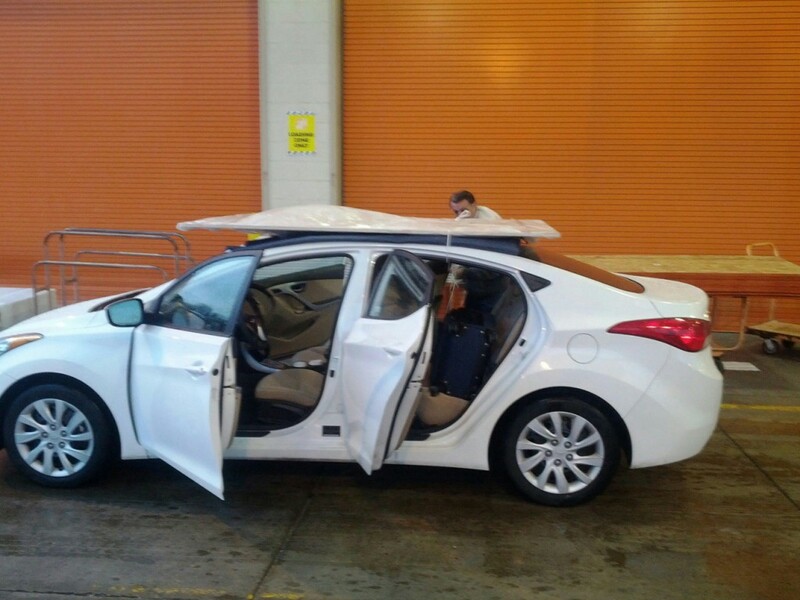 You can see below the images of that poor rental car getting sheets of plywood tied to it’s roof. Sorry Hertz! They quickly uninstalled the Kiosk Machines and set to replicating the wood that was already in the room After several hours of getting everything just right the team was able to leave to make their afternoon flight by the skin of their teeth. The result as you can see below was a happy customer and a beautiful looking install. Because the way the billing worked between Olea and Nike the cost only worked out to be the materials and tools purchased at Home Depot and not a penny more. Olea didn’t see this as an opportunity to gouge a customer when the chips were down but instead an opportunity to strengthen a relationship and prove that we care about the quality of our work and that every detail matters no matter how it has to happen.